Detailed listings, includes links to webpages. ​Directory summaries are printed in FW. Next, our DIARIES: List 5 Festivals. List 6 Workshops. Folklife Quarterly reverted to its previous title, Folklife West, starting Oct 2018 issue. National & regional lists, by area. 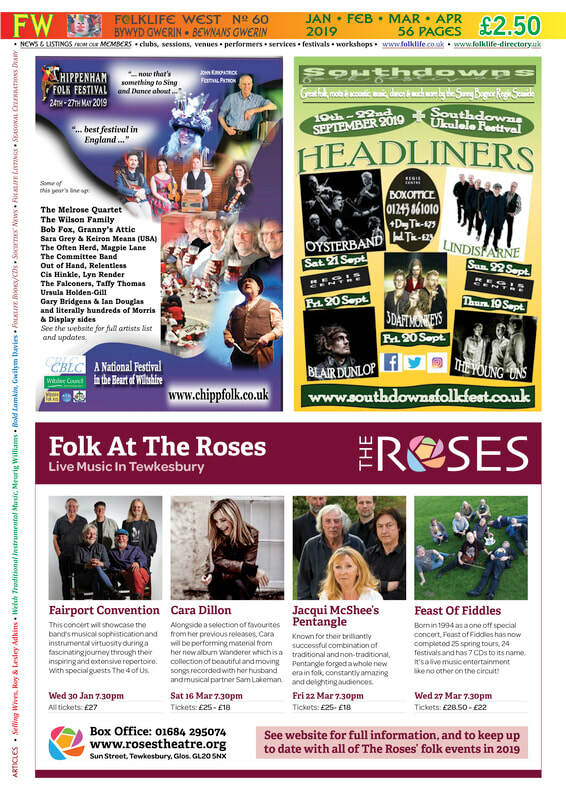 ​….. Member-festivals - for the next 12 months! Plus adverts as in the latest FW. These listings are in our new (Nov 2017) Folklife Traditions Directory on www.folklife-traditions.uk. Or, for more information, see Folklife-Traditions webpage on this site. Also, in FW, every issue, we print the current 4 months, with photos and notes. ​For 'Folk' listings, Lists 1 to 6, we list Folklife Members only. This costs £15 a year; please see "Info" page.